I am looking to start my career in metal fabrication. What should I expect? As with many trades, careers in metal fabrication can have very favorable prospects particularly for those who are highly skilled and trained in the latest technology. Specialty trades include sheet metal workers, welders, assemblers, fabricators, field installers, pipefitters, and ironworkers. Increasingly roles like CAD Designer and Laser Cutter Operator are available. It can also include sales and engineering roles, based on education an experience. See below for more detailed information. With an increasing demand for skilled trade labor in the United States, a career in metal fabrication is both an extremely rewarding path for those looking to enter the workforce as well as a field that offers growth and advancement through the constant evolution of technology. Jobs in the metal fabrication industry range from welders to CAD designers, as it is a field that offers a variety of exciting opportunities. Metal fabrication is a vital part of numerous industries including architectural, manufacturing, automotive and aerospace. From bridges and skyscrapers to the components that allow your automobile to run, metal fabrication is an essential component in construction. If you are entering the workforce or seeking a career change, consider both the financial and personal benefits a career in metal fabrication can provide. The main component of a metal fabrication job is to create and assemble metal parts by utilizing a range of different tools, cutters and machines to match the specifications of blueprints. 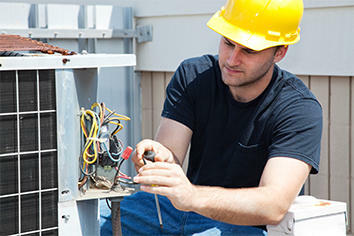 Fabricators may also assist in the manufacturing and assembly of individual components and even finished products. Jobs in the metal industry are ideally suited to those who enjoy working with their hands and applying their technical knowledge to highly specialized technologies utilizing engineering and manufacturing. Careers in metal fabrication require unique skills, specialization and the ability to adapt to the new technology and machinery utilized in the manufacturing process. 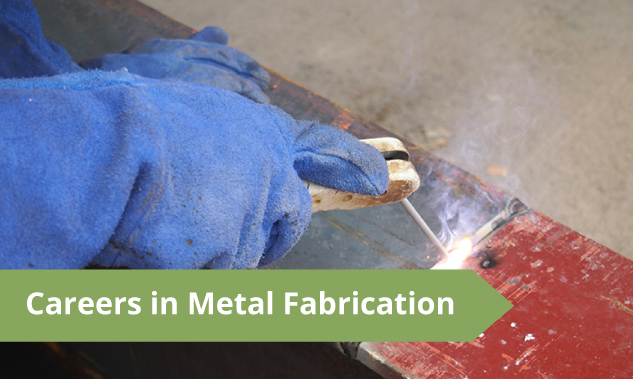 The metal fabrication industry requires skilled laborers to utilize raw materials, read blueprints and have strong mathematical and communication skills. Industry projects can range from architectural fabrication to automotive, railroad, equipment and parts manufacturing. In addition to new advancements in computer-aided drafting and design technologies, plasma and laser-cutting technologies are now drastically reducing the time spent in the shop needed to produce items from concept drawings to completed products faster than ever before. In a constantly changing industry, those who can utilize traditional fabrication skills and apply the use of new technologies in the manufacturing process will find rewarding opportunities in the future. How to Become a Metal Fabricator? Similar to other professions, the path you choose to enter into the metal fabrication industry will vary depending on your own personal interests, career goals, experience and the opportunities available in your region. With nearly 100,000 skilled workers set for retirement, the demand for laborers is expected to increase drastically over the next decade. For those wondering how to get into metal fabrication, acquiring the work experience, technical expertise and education required to enter the industry will be the first step for many seeking to advance in the field. Entry-level positions may be the first step for many, while pursuing additional education might be a way for others. Depending on what branch of metal fabrication career you decide to pursue, education and skill requirements vary. In some cases, a high school diploma or GED may be the only requirement needed to find entry-level work in the field. On-the-job training, education and other opportunities for advancement into more specialized work may follow with experience. However, more specialized positions may also require some knowledge that can be obtained by attending a secondary or vocational school. In addition to earning an Associate of Applied Science degree in technical skills needed for metal fabrication, certifications and technical diplomas are also available for those seeking a career in metal work. Strong mathematical knowledge, metallurgy knowledge, the ability to read and interpret blueprints and strong communication skills are all essential to performing most job duties of metal fabrication. For those that are seeking certain jobs in the field, a Bachelor of Science degree in manufacturing and engineering may be needed for better job prospects. Whatever course you choose to pursue, the demand for skilled metal fabricators is expected to grow at above-average rates through the next decade. Metal Fabricator – A metal fabricator is anyone that cuts, bends, shapes or assembles metal components for a required purpose. From manufacturing products to artistic designs, metal fabrication can also include working with raw materials or the assembly of metal components for the creation of a finished product. All types of metal fabrication jobs, from machinists to welders, are sometimes included in the general definition of metal fabricator. Machinist – A machinist is a person who specializes in the creation or modification of metal components through the process of machining. This can include the use of computer numerical-controlled, or CNC, machines that can shape metal through precise tools driven by a computer which utilize cutters, mills and lathes. CNC manufacturing is part of computer-aided design and manufacturing processes. Welder – Welders are individuals who are responsible for adhering two pieces of metal together to required specifications through the use of electricity, intense heat, or another metal component. There are different types of welding jobs, as welders are essential to a range of manufacturing, automotive and aerospace industries. The American Welding Society, or AWS, is an organization that certifies welding. While the U.S. Bureau of Labor Statistics job outlook projections for welders, cutters, solderers and brazers is moving slower than average, the career choice for welders offers numerous opportunities in a variety of industries. Success in the welding field requires precision, dexterity, knowledge of metal, attention to detail and the ability to sit or stand in one position for a long period of time. In addition, the environments welders work in can range from warehouses to underwater, depending on the job. Full Welder – Full welders are skilled tradesman that have experience in a variety of tasks and are capable of working in many industries. Skills for welding include knowledge of metallurgy and strong mathematical skills. Many skilled welders in different industries may be subject to working in unusual conditions and face environmental challenges including weather. Shop Welder – Shop welders are primarily tasked with fabrication welding roles that involve working in a shop to manufacture metal components and products. While some fabrication shops are not heated or have air conditioning, shop welders are not always subject to the fierce weather conditions of other welders. Welder Helper – A welder helper is a laborer tasked with assisting a full welder or shop welder with the tasks of welding and cutting metal. Since it is a physically demanding job and one that requires precision, welder helpers are essential for many fabricating tasks. Millwright – What is a millwright? Millwrights work in a variety of manufacturing and engineering industries and are responsible for the installation, assembly, maintenance and dismantling of industrial machinery and equipment. To be a millwright, advanced knowledge of blueprints and load-bearing capabilities is needed to assemble and maintain the equipment utilized in metal fabrication. Sheet Metal Mechanic – The task of cutting, bending, shaping, assembling and joining together pieces of sheet metal to create various products is the primary responsibility of a sheet metal mechanic. Sheet metal mechanics are responsible for many of the assembly and fabrication tasks needed in the shop. Sheet Metal Layout Technician Sheet metal layout technicians are responsible for a wide range of fabrication tasks involving precision measurements for the layout of complex designs. In addition, they are also required to assist in the assembly of components and products. By utilizing their mathematical knowledge, sheet metal layout technicians are responsible for taking accurate measurements of angles and curves and building form blocks and patterns. Industrial Mechanic Industrial mechanics are primarily responsible for the maintenance of machinery, equipment and systems utilized in the metal fabrication industry, as well as many others. By utilizing their vast mechanical knowledge, they are often responsible for ensuring motors, pneumatics, conveyor systems and other essential machines continue to run smoothly to maintain productivity and safety in the work environment. According to the U.S. Bureau of Labor Statistics, the average career outlook for metal fabrication is positive, with expected growth between 15 percent to 22 percent over the next decade. The percentage varies between the specific role in the industry, but for almost all aspects of the field, the demand for metal fabricators is increasing. According to the Bureau of Labor Statistics, metal fabrication jobs in the United States hover near 80,000 currently. States like Texas, California, Oklahoma, Ohio and Pennsylvania hold the most promise for metal fabrication careers, as they currently hold the highest number of industry jobs in the country. Most metal fabricators work roughly 40 hours per week. Depending on the role you have and the size of the company, work environments can vary. Many metal fabricators work in plants and large manufacturing facilities, while others are self-employed and are more flexible in their work hours and where they perform their job duties. In addition, many find employment with smaller employers and work in warehouses and indoor facilities. For some welders, outdoor work may be required, depending on the industry. Metal fabrication sometimes requires standing and sitting in a position for long stretches of time and may require heavy lifting and physical strength for more rigorous tasks like lifting metal. There are many exciting opportunities for individuals who want to know how to get into metal working. Like many other professions, career progression is dependent upon your education, experience and your own personal desire to develop yourself professionally. For those who want to enter the workforce immediately following high school, many entry-level positions are available with a diploma or GED. For those seeking more specialized roles in the industry, attending a vocational school, community college or university may be the best choice to strengthen the skills needed. A first step into the field might include talking with the human resources department of a local metal fabrication company or contacting your local community or vocational college for educational opportunities. In addition to formal education, apprenticeships, internships, or co-op programs are also great ways to gain the valuable knowledge and skills needed to become a skilled tradesman and advance your career. At Tuckey Metal Fabricators, Inc., we look for individuals who like the challenges of creating unique products and innovative ways to produce and manufacture new things. For more information on opportunities at Tuckey Metal Fabricators, Inc., just call (717) 249-3733 or visit www.tuckey.com. There are many opportunities in the metal fabrication industry. Like many job markets, ease of entry into the field as well as career progression is dependent upon education, experience, and a general desire to develop yourself professionally. At Tuckey Metal Fabricators, Inc., we look for individuals who have a personality that likes the challenges of creating unique products and innovative ways to produce and manufacture new things. A first step into the field might include talking with the human resources department of a local metal fabrication company or contacting your local community or vocational college for educational opportunities. For more information on opportunities at Tuckey Metal Fabricators, Inc., just call (717) 249-3733 or visit www.tuckey.com.